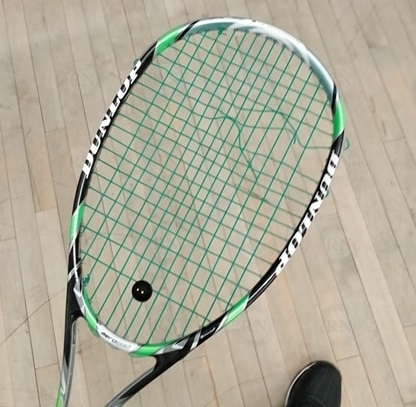 Squash strings break for a variety of reasons. The purpose of this article is to help players understand the symptoms of different kinds of breaks so that they can make the appropriate changes. Image 1 – Top sheer breaks are usually caused by overhand serves. Players who serve overhand often break strings in the way seen in Image 1. Counting out from the top center of the racquet, sheer breaks caused by serves will often affect two of the first eight vertical strings. Whereas sheer breaks that occur on the side of the frame (Image 2 below) are usually the result of drives. Image 2 – Side sheer breaks are usually caused by hitting drives off center. Grommet breaks look like sheer breaks because they also occur along the frame line. The difference is this: if the grommets where the break occurred are broken or split, then the cause of the break is assumed to be the defective grommet. Image 3 – Broken or missing grommets cause the frame to cut the strings. In determining whether or not the grommet is the cause of the break, it is important to look closely at the grommet, because grommets can be split and still appear to be intact. If one or more grommets are missing, as in Image 3, the diagnosis is easy. But if they are split, it may not be so easy because they may not appear to be broken at first glance. Wear breaks occur in the center for the string bed nowhere near the frame. They are called wear breaks because they are usually the result of long term wear and tear. Over time, the strings cut into each other at the crosses. Eventually, one cuts through the other and it breaks. Image 4 – Wear breaks occur in the middle of the string bed. We treat wear breaks that occur in less than two weeks as a warranty issue. This is based on the assumption that some strings are defective and will break prematurely. The dividing line of two weeks is arbitrary because string that is defective should break the first time you use it. If you play two weeks or more without breakage, then it is likely not defective string. After two weeks, we consider it a wear break. Sheer breaks at the top of the frame are easy to diagnose. If you serve overhand and are breaking strings and/or racquets regularly, you are hitting everything — balls and walls — much harder than you need to and you may want to make some adjustments to your game. While you are welcome to play anyway you want to play, you must understand that playing this way is a choice. Most importantly, it is an expensive choice. If you choose to play a power game in which you are pounding serves and smashing walls, then you are choosing to bear the financial burdens of replacing the strings and racquets you will be breaking. Do not — DO NOT — blame the string, the stringer or the racquet manufacturer. 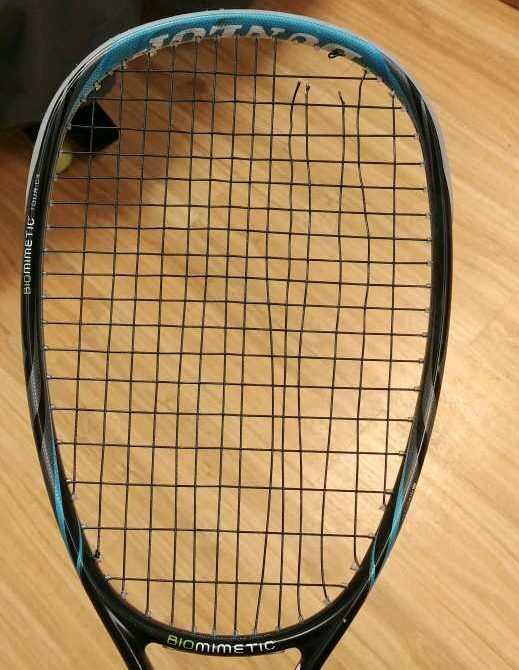 If you choose to play this way, man up and accept the fact that you are breaking strings and racquets that other players would not be breaking under normal usage. If you are not serving overhand and are not breaking racquets regularly but are still suffering frequent sheer breaks, then it’s a different issue. If you are 100% certain that broken grommets are not to blame, then it is almost certainly a string durability issue. Like the pounder in the last example, you are overpowering the materials in your string bed. The question is why? Are your strings too thin? Frequent string breakers should not be using anything thinner than 17 gauge. Are your strings too soft? 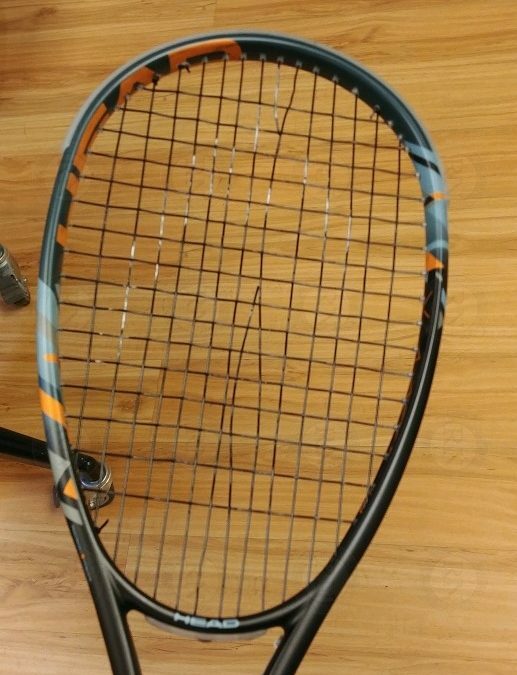 Frequent string breakers should not be using Tecnifibre squash strings. Is your string bed density too low? Frequent string breakers should not be using a racquet with less than 14 mains and/or 19 crosses. Whatever the issue, we will be able to help you figure it out. 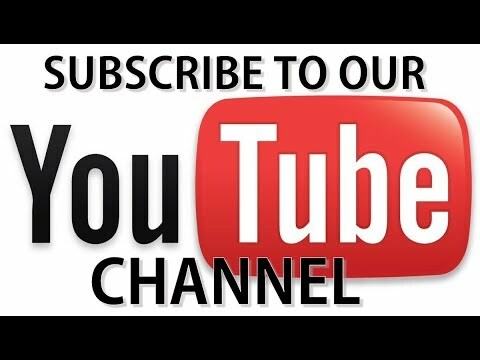 Whenever you bring a squash racquet into our store for stringing, we add a note to your account. We record the racquet, the string, the type of break and the location of the break. This allows us to diagnose patterns over time for our customers. Logging details in customer accounts in this way even helps us diagnose and avoid wear breaks. For example, we have been able to save some customers lots of money by encouraging them to change to more durable strings even before they became aware of issues. As players increase in levels, for example, we sometimes notice that they are wearing strings out faster than they realize. In other words, the data helps us help our customers. The one area where data does not help anyone, unfortunately, is the notorious grommet break. Grommet breaks are completely unpredictable. They seem to happen at random and, once broken or split, lead directly to broken strings. 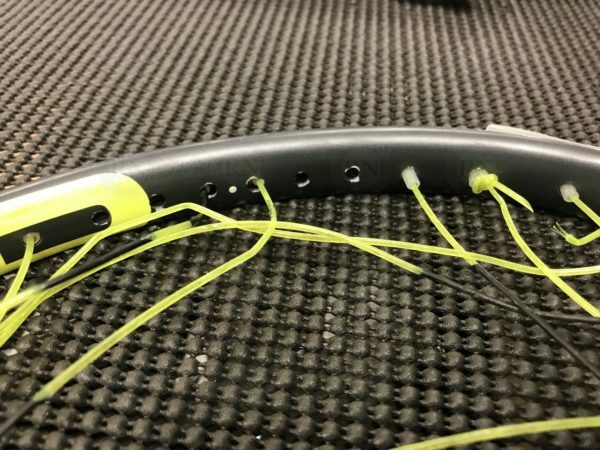 The best we can do is to advise players to maintain their racquets and replace grommets as soon as they break.